Just when you thought it was safe to go back to the water… it is. Rumours about there being great white sharks in Thailand are greatly exaggerated. One of the search phrases that regularly brings people to my regular travel blog Travelhappy is “are there great white sharks in Thailand”. Presumably these searchers are checking up to see if their tropical holiday in Thailand is going to be cut short by a great white shark attack off the beach at Phuket or maybe while scuba diving in Koh Tao. The short answer is: no, there are no great white sharks in Thailand. I am not a great white shark expert, but I am pretty confident that great white sharks have never been seen in Thai waters. It’s simply too warm for them. Great whites generally prefer colder waters – hence why they’re found concentrated around South Australia in the AustralAsia region. (You can go cage diving with great white sharks in South Australia – see my Great White Shark article for Asian Diver magazine and my interview with great white shark survivor Rodney Fox). 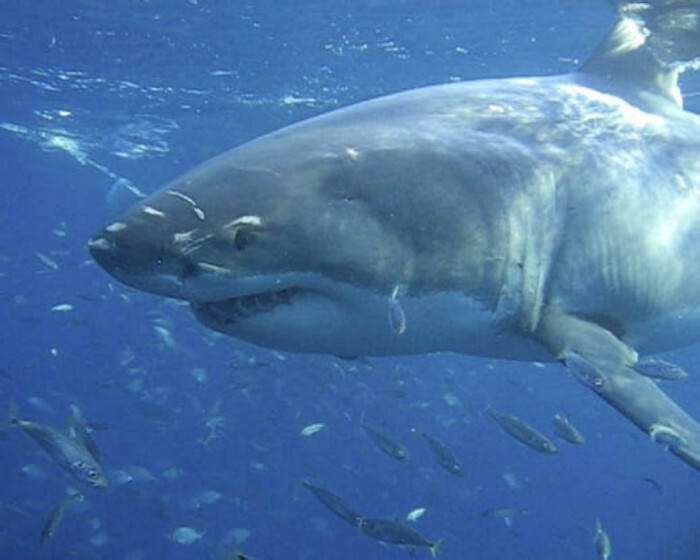 There have been reports of great whites seen as far up the Australian coast as Townsville – which is Great Barrier Reef territory – and also around Ningaloo Reef half way up the west coast of Australia, so whites clearly move around in warmer waters too. In June 1993 John Ford was fatally attacked by a great white shark while scuba diving with his newly wed wife in Byron Bay. [detailed in Hugh Edwards’ book Shark: The Shadow Below]. In November 2000, a businessman was fatally wounded by what was thought to be a great white while taking an early morning swim at Cottesloe, one of Perth’s most popular beaches. [BBC link]. So definitely exercise caution in the water in Australia. Back to Thailand: Of the hundreds of species of sharks, there are only four kinds of shark known to be dangerous to humans – great whites, tiger sharks, bull sharks and oceanic whitetip sharks. Bull sharks and Tiger sharks have been located occasionally in Thai waters but they are very rarely encountered by divers as they prefer staying at depth. There have been no recorded fatal shark attacks in Thailand on scuba divers or swimmers. The shark divers are most likely to encounter in Thailand is the grey reef shark, which grows quite large – up to 2 metres – but is harmless. Snorkellers will often see baby sharks on shallow reefs as these are shark nurseries – Shark Bay on Koh Tao is an excellent example. In short, the prospect of being attacked by a shark while in the water in Thailand and incredibly small. There are plenty of other things more dangerous to worry about, like rip tides if swimming on the beach or having a motorbike accident. And there is zero chance of being attacked by a great white shark while in Thailand!